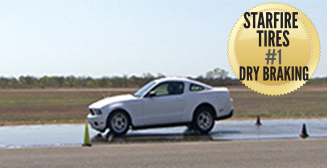 The dry braking test shows how far it takes for the vehicle to stop in dry, everyday conditions. The vehicle approaches at highway speeds of 60mph (96kph) before performing a full ABS stop. Instruments inside the car measure the distance it takes the vehicle to make a complete stop. This test really shows how your tyre will perform in emergency situations. It is when the unforeseen occurs, you want to know the tyre fitted to your car will stop the car in time.